Every day millions of Tamil women in southeast India wake up before dawn to create a kolam, an ephemeral ritual design made with rice flour, on the thresholds of homes, businesses and temples. This thousand-year-old ritual welcomes and honors Lakshmi, the goddess of wealth and alertness, and Bhudevi, the goddess of the earth. Created by hand with great skill, artistry, and mathematical precision, the kolam disappears in a few hours, borne away by passing footsteps and hungry insects. This is the first comprehensive study of the kolam in the English language. It examines its significance in historical, mathematical, ecological, anthropological, and literary contexts. 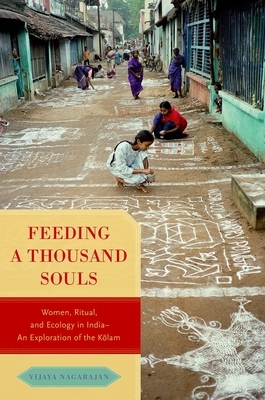 The culmination of Vijaya Nagarajan's many years of research and writing on this exacting ritual practice, Feeding a Thousand Souls celebrates the experiences, thoughts, and voices of the Tamil women who keep this tradition alive.